Making an egg sandwich can be as simple as slicing up a hard boiled egg. Enjoy a toasted whole-grain bagel with mayonnaise or basil pesto, topped with lettuce, tomato, cheese and slices of hard-boiled eggs for a quick and easy lunch. Toast bagel if desired. Spread both half with mayonnaise. 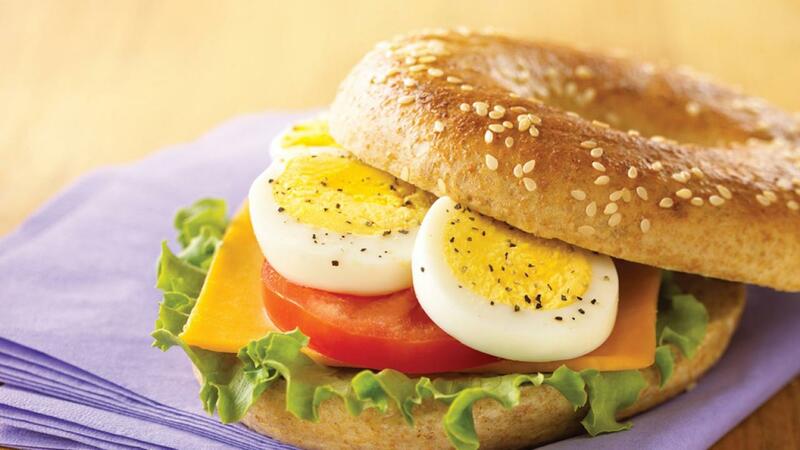 Top bottom half with lettuce, tomato slices, hard boiled egg slices and top half of bagel. Basic method for hard boiled eggs: Place cold eggs in single layer in a saucepan. Cover with at least 1 inch (2.5 cm) of water over top of eggs. Cover saucepan with lid and bring water to boil over high heat. Immediately remove pan from heat to stop boiling. With lid on saucepan, let eggs stand in water for 18 minutes (large eggs). Drain water and immediately run cold water over eggs or let them sit in cold water until cooled. Refrigerate hard boiled eggs immediately and use within one week.